When the skin is cut due to an injury or surgery, it heals by forming a permanent scar. This is a normal part of the healing process. Over time the scar becomes less pink and noticeable, but occasionally, may be thick and raised. The growth of scar tissue is influenced by many factors - the severity of the original injury; the size, depth and location of the wound - the back, shoulders and chest above the breastbone tend to be worse; heredity factors - unsightly scarring can run in families; racial background; skin pigmentation; technique of initial surgical repair; a person's state of health, fitness and nutrition; the person's age; diabetes; smoking; a complication during healing - infection, inflammation, bleeding or delayed healing. The decision to have surgical revision of scars should only be made after discussion with your surgeon. Most smaller scars can be surgically revised under local anaesthetic in our Plastic Surgery Auckland day theatre. Treatment of more extensive scars may require admission to hospital and general anaesthesia. 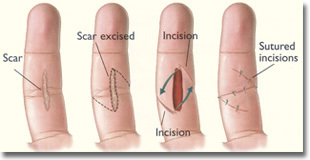 Many non-surgical and surgical techniques are used to treat troublesome scars. A combination of methods usually achieves the best results. The complete 'Treatment of Scars' pamphlet is available from Mr Murray Beagley.